His headstone simply says, “James Hunton – Killed by Indians – May 4, 1876 – Aged 24 yrs”. Tension between the native inhabitants of the Great Plains and the encroaching settlers resulted in a series of conflicts … this eventually led to the Sioux Wars. OK, back to Hunton and a connection (although indirect) to the Islands. (I don’t mean to be repetitive, I just want you to remember that LaLie was Little Bat’s sister.) LaLie later left Hunton and married Frank Grouard – that marriage didn’t last either, and she left Grouard, too. He learned the landscape, customs and traditions – all the while constantly on alert to escape captivity. Around age 26, he eventually escaped from his Indian captors. Then, Grouard (Standing Bear) became an Indian Scout in the American Army under General George Crook, fighting Sioux Indians. Almost every summer for nearly a dozen years, Grouard was in the field as a scout, commanding as many as 500 scouts and friendly Indians with all the Indian fighters who made reputations in subduing the Indians. He was wounded many times, suffered almost incredible hardships, saved small armies on several occasions and often saved the lives of individual men and officers. OK, one other bit to this story … John and James Hunton are Nelia’s Great Great Uncles. Whoa, that’s getting waaay ahead of ourselves … let’s look back. There were two factions in the camp – one led by Chief Sitting Bull, the other led by Chief Crazy Horse. Grouard was held for nearly seven years, during the first two of which he was practically a prisoner. He learned the landscape, customs and traditions – all the while constantly on alert to escape captivity. Around age 26, he eventually escaped from his Indian captors. Then, Grouard became an Indian Scout in the American Army under General George Crook, fighting Sioux Indians. By February 1876, believing there was peace, many Indians were leaving the reservations in search of food. Orders had been given by the American government to return, but they did not take it seriously. General Crook began his winter march from Fort Fetterman, March 1, 1876 with many companies of troops. When Sitting Bull learned that Grouard was the scout for General Crook, he saw the chance to kill Grouard in battle. By March 17, Grouard located Crazy Horse’s village on the Powder River in Montana. (Dodson) In May 1876, in preparation for the summer campaign, the Army was fitted out at Fort Laramie, Wyoming. Grouard continued in the service of the US government until the end of the Indian Wars. Frank Grouard died at St. Louis, Missouri in 1905 where he was eulogized as a “scout of national fame”. There is more to the story … After serving with the Confederate Army during the Civil War, John Carpenter Hunton came West to work at Fort Laramie. His brother James came to join him in 1876; James’ headstone tells the rest of his history that ended later that year – “Killed by Indians”. As noted above, the Sioux Wars military campaign provisioned at Fort Laramie, prior to heading north to South Dakota and Montana. Hunton was fort sutler (providing provisions out of the camp post) – Hunton and Grouard were at the fort at the same time, so it is likely they met. They had closer ties than that. Hunton lived with/was married to LaLie (sister to fellow scout (and half-breed) Baptiste Garnier (Little Bat.)) LaLie later left Hunton and married Grouard – that marriage didn’t last either, and she left Grouard, too. Oh, one other ‘rest of the story’ … John Hunton is Nelia’s Great Great Uncle. On trips to Colorado and surrounding areas, we visited Fort Laramie and the John and James Hunton gravesites in Wyoming. 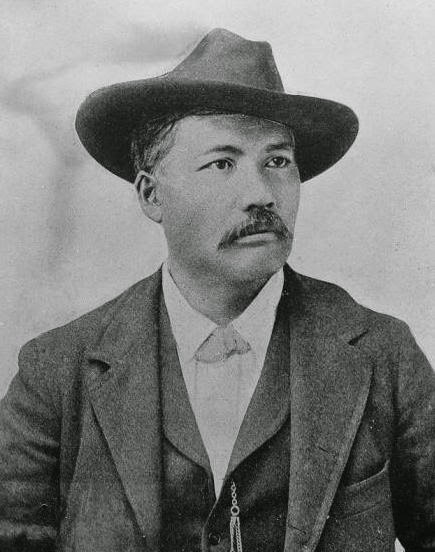 The image shows Frank Grouard. In addition, I have included other related images in a folder of like name in the Photos section on my Facebook and Google+ pages.